I’m a process guy. Systems. Because it’s about the results. Not because I’m a fan of the gears, cogs and funnels. It’s about paying customers. Nothing else. Everything else is details. “We intend to take our business to $60 million by the end of 2017,” says the CEO. That’s great. How? What follows sounds like a strategy session. High level strategy. It lacks details. So the question continues. Plans matter. Pre-thinking does, too. But they only matter if you can pull them off. The most brilliant plan poorly executed is a colossal waste of time and effort. Today’s show was mostly prompted by too much time devoted to talking about reasons, purposes and intentions. Put ’em all in a bucket and stir. Pour out the bucket any way you want. I don’t much care about it because it only matters if the actions matter. Before you conclude that I’m being a heartless jerk let me talk a bit about gratitude. We’ve all got a long list of things for which we should be grateful. My list just keeps growing no matter how badly I screw up. I have much to be thankful for. Why does gratitude matter? Because I know how taking action can often lead us to think we’re all that, and then some. Too many people confuse motion and action with their own self-importance. And that can negatively impact effective execution. Effective execution is what matters! 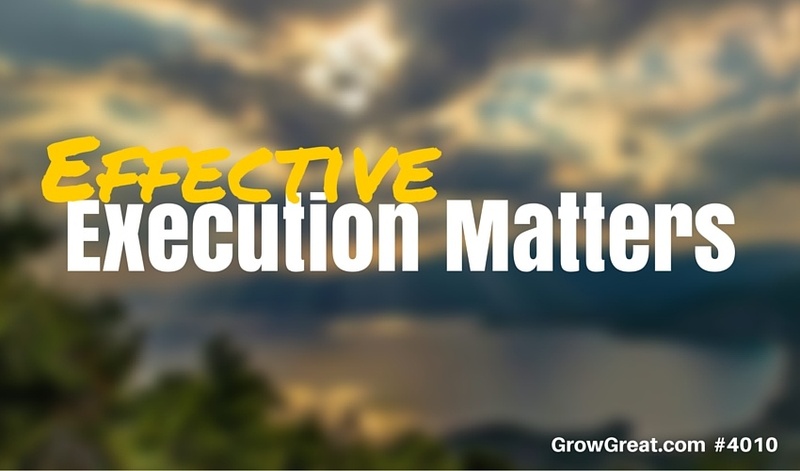 I should have executed a better title – EFFECTIVE execution matters. Plan. Strategize. First, count your blessings. Be thankful. Be grateful. Show that gratitude to the people who have helped and supported you. For those of us who operate with a faith-priority, thank God. Don’t get too full of yourself. This was brought home to me recently when I heard a very smart economist give a presentation, during which he said there are just 4 reasons why businesses experience trouble: the economy experiences trouble and your business mirrors the economy, your industry experiences a downturn and your company follows the industry, a black swan event (these can’t be predicted or forecasted) and you screwed up. That last one will force all of us to admit we’re mere mortals who sometimes get it wrong. That’s why gratitude matters. Because humility is a virtue in spite of what some might tell us. I’ve sometimes suffered ridicule for my focus on the process. Mostly by people who fail at gratitude. Funny how that works. The people most full of themselves focus squarely on results. Of course it’s always on their positive results. They love to be the “told you so” people. They also are the braggarts among us. I’ll tell you why I think they’re wrong and why I choose not to surround myself with them. A person may take an aim to get rich (the result). How they get rich doesn’t much matter. They’re simply consumed with a strong desire to get rich. They define getting rich as earning a million bucks a year. Review people who earn a million bucks a year and you’ll see many different ways to get there. A million dollars earned in a single year. You’ll find some who did it one year, others who did it for many years and some who did it for decades. You’ll also find varied degrees of happiness or unhappiness among them. And you’ll find activities ranging from honest to dishonest, legal to illegal. There are lots of ways to get there. Focusing on the result doesn’t answer the question of how. Without an answer to how, we’re left without execution. Let me make it even more clear. The results oriented folks love to offer meaningless advice. “Just make it happen,” they may say. “Do what you have to do,” is another popular one I hear. I jokingly say it’s like me telling somebody that the way to become a millionaire is to first get a million bucks. I did a podcast episode about the importance of “the process” that I’d offer you to consider. It’s episode 4010 of my podcast at LeaningTowardWisdom.com. I’ll warn you that it’s a more personal podcast than this one, but I’m pretty proud of that episode. Most of us care about those things. Sure, I’ve met a few people who claimed they didn’t care — as long as they got what they wanted. Usually those were the very ones mostly focused on personal income. To each his own. I’m not really judging those folks. I’m just saying I choose not surround myself with them because I get no energy from them. I selected the word execution because it’s so frequently used. In business. In sports. And people – mostly guys – love to use sports analogies. The contrarian in me would use a different word, but we all understand execution. Execution is just another word for doing stuff. Well, more precisely it’s about doing stuff well. McKay’s original Buccaneer teams didn’t do much well. Getting it right wasn’t easy for an expansion team in the NFL. In fact, they played 26 games before they ever experienced victory. Getting it right can take time. Mostly it takes doing what’s necessary day after day. It’s mostly determined by how you spend your days and with whom you spend it. I only know the NFL from a fan’s perspective. I know it’s fundamentally exactly as McKay saw it. Blocking, tackling, running, passing and kicking. Every team is focused on winning. They all want to get it right. With multi-million dollar budgets you’d think more of them would – get it right. If focusing on the results did the trick, they’d all be competing for the Lombardi trophy. But it’s about more than that. It’s one thing to dream it up. It’s something completely different to make it happen. In business, I have found some people who were brilliant dreamers. They could come up with many wonderful, seemingly awesome ideas. A few of them even knew how to launch that idea into some form of reality, even if it was very small. And I love ideas, especially ones that I think are very good. But growing an idea – growing a business – is a different thing. I’m fortunate to have been called some decent things during my career (we won’t talk about the bad names I’ve been called). Sometimes people have called me “strategic.” Some have called me “an operator.” Others have called me a man of “action.” All compliments. And all because for as long as I can remember I’ve embraced the process – a process that was important to me. A focus on how I spend my days and with whom. In a future episode we may talk about the difference in creators and growers, but for now I’d like to provoke you to think about your work — the stuff you actually do. I’m not judging what you do, or don’t do. I just want you to consider what you’re doing and ask a few questions that may help you clarify it. First, I’m going to assume you’re sitting in a chief leadership role. Since I mostly serve C-level leaders, CEOs in particular, I’m focusing on you because you’re the Number One Employee. The buck may stop with you, but the momentum or traction begins with you, too. What Can You Alone Do? Make a list of the things that only YOU can do. Because of the seat that you occupy, it’s a chore that can’t done by anybody else. Go ahead. Write it down. It may be a long, long list…or a very short one. That doesn’t matter. Just list it. Don’t sweat about explaining it. As long as you can read the list and understand, that’s good enough. I don’t even want you to be concerned with the length of the list. I know, I know. I just asked what you alone can do, now I’m asking you to look at that same list and figure out what somebody else other than you can do. No, I’ve not lost my mind. Humor me. Look at the list and think of somebody on your team who can do the things on the list. No, I don’t expect you to figure out somebody for each task, but I do expect you figure out somebody who can handle something! Maybe three things. While you’re at it, go ahead and write down the name of the person by the item. That person who you think could handle the chore. Let me add one small caveat – they can do it well enough to succeed. Don’t get stuck on thinking, “I can do it better myself.” The challenge is to figure out if the task can be successfully executed by anybody other than YOU. What Do I Avoid Doing Because I Hate It? This is a different list. Well, maybe. Write down the things you avoid doing because you dread doing it. These might be things on your original “only I can do it” list, but they probably aren’t. These are probably things you don’t ever do because you just hate doing them. Go ahead. Write them down. I don’t care why, and honestly, you don’t either – do you? You just know you despise doing them. Good enough. Make the list. What Do I Always Do Because I Love It? Now, let’s flip it upside down and list the things you love doing because you just love it. Who knows or cares why? It doesn’t matter. And it doesn’t matter if somebody else can do it. Are there things on this list that also made that original “only I can do it” list? Maybe. I’d even go so far as to say probably. That’s okay. Write them down. Who On My Team Loves Doing What I Hate? Now it’s going to get a bit tougher – maybe. Think about your team. Think about what you hate. Maybe you hate what you’re not good at. Maybe you hate what you’ve been good at, but you’re sick of it at this phase of your career. No matter, match up the stuff you hate doing with the people on your team who you know love doing that exact thing. If you can’t be sure, then guess who based on what you know of them. So, you’re writing down who on your team loves doing the thing you hate, or who you THINK may love doing the thing you hate. Let’s stay right here for the moment. I’m assuming you’ve got names that you’re pretty set with – names of people you know love doing what you hate. Question: do you have them doing what they love? Are they doing those things you hate, but the things they love? If not, why not? I’m really sick of the bus metaphor made famous by Jim Collins…and I’d love to go just one week without hearing some corporate executive use it, but boy has it permeated the business world. Why do you have the wrong people on the wrong seats on the bus? Now, think about what you love. You may not know why you love it. It’s likely you have a more keen awareness of why you hate what you hate. Step outside yourself and imagine somebody who can feel like you do when you love doing something. Except they feel that way doing what you hate. I know, it’s hard, right? Well, try. Go back over your list of things you hate and revise it if you want. Add names. Take names off of it. These are the names of people who love doing what you hate. Go back over your original “only I can do” list and adjust the stuff that’s on there that you hate. I guarantee you’ve got at least one, probably more. Remove those from your original “only I can do” list and just keep them on this “who on my team loves doing” list. Now, before we move on. Commit to delegating that task to that person. Do whatever you must to get it off your list and onto theirs. You owe it to yourself and to them. Stop doing what you hate. And stop keeping other people from doing what they love. No, we’re not done yet. Not quite. Who On My Team Loves Doing What I Love? These are your kindred spirits. You think so anyway. It may be good for you, but it’s how most of us roll. Birds of a feather and all that. List the names of the people alongside the list of things you love to do. I’m betting you’re able to come up with those names faster and easier. I’m also betting there’s more of them. Funny how that works, huh? And as you’re writing down these names you’re probably thinking of yourself, too. I can hear that little voice in your head saying, “Joe is good at it. I’m better, but Joe’s pretty good.” Because it’s what you love doing you’re comparing how well you do it versus the other people on your team. You’re competitive like that. It’s okay. I get it. As the chief leader I’m here to tell you that you’re too busy with stuff that doesn’t matter. I’ve yet to see a CEO who isn’t pressed for time. Or one whose schedule isn’t severely packed. But the CEO or other top leader is exactly the one (or ones) who need the most margin in their life in order to serve the others in the company. They just don’t make the time. They have the time. Too often they just choose not to take it. Instead, they’re doing the things they love. And sometimes the things they hate. It’s not for lack of motion or action, but too frequently it is for lack of effective execution. Today’s word is “hustle.” We love the word because it denotes energy, tenacity and doing, doing, doing. Sadly, we confuse running fast with getting somewhere. It’s possible to run fast without getting anywhere. Leaders are doing it all over world. As the number one employee you deserve to make an investment in yourself. Your own growth and your own leadership have a ripple effect that will impact your organization. For good. Or bad. You choose. Refuse to take the time. Refuse to make the investment in yourself. You’ll pay. So will your team. So will your business. See yourself as the valuable resource you are. Take the time. Make the investment. Your growth will become your team’s growth and your company’s growth. It can’t be helped. It can’t be accomplished any other way. Your direct reports and all other employees deserve the best leadership available. That’s your job. Be that leader or be replaceable. Again, you choose. The execution – effective execution – hinges on people doing the things they’re great at. I know, I’ve not talked about judging people on skills. That’s because I started with where our hearts at. And maybe it’s not 100% accurate, but most of us tend to be good at – or we have the capacity to get really good at – the things we love. Rarely do we develop a knack for something we dread or hate. So I’m going with that premise. If you’ve got an odd situation where you, or somebody on your team, is great at something they hate, then brace yourself for a short-term effective execution of that thing. Even if people are great at something they hate, they won’t keep doing it for long. Don’t count on it for your long-term strategy. People talk alot these days about employee engagement. I’ve got two simple strategies for it: a) give people work they love to do and b) talk with people. Do more of both and it’ll work. So what does all this mean? It means if you get execution down – if you figure out the best way to spend your days and the best people to spend your days with – then you’ll achieve more. Period. It requires a boldness and courage I don’t see nearly often enough. Too many big bosses are busy behaving the way they think big bosses should behave. They think they’re supposed to have all the answers. They grow too full of themselves. They over value what they bring and they under value what others bring. They develop unrealistic beliefs about their success – or their company’s success. And sometimes unrealistic beliefs about the market or the competition. In short, sometimes the best of us can grow delusional. Today, it’s about a reality check. It’s a human heart reality check designed to make you think about your own work flow, systems and processes. Dig deeper than I have and figure out what’s working well, what’s not working at all and what may just need some tweaking. Start by taking a much closer look at how you’re spending your time as the chief leader. Ask yourself if somebody might be able to do that job…perhaps better! Consider some possibilities you may have never considered. Because effective execution matters. Frankly, not much else matters because at the end of your career it’s all going to have been a matter of how you spent your time and who you spent it with. Make the most of it.